CAPE CANAVERAL, Fla. -- The six astronauts set to ride the space shuttle Endeavour on its last mission to space arrived in Florida today (April 26) and the clock is ticking down toward their Friday blastoff. The crew flew in this morning aboard T-38 jets from Houston, where the astronauts live and train. They arrived at Kennedy Space Center's shuttle landing facility at 12:52 p.m. EDT (1852 GMT). The countdown toward launch began today at 2 p.m. EDT (1800 GMT). 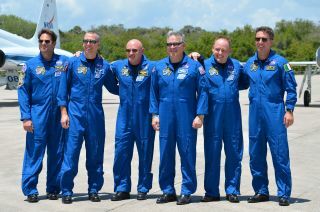 The veteran crew is led by astronaut Mark Kelly, whose twin brother Scott Kelly is also a NASA astronaut. "We're really happy to be here," Kelly said after stepping down from his jet. "It's a beautiful day. It's great to see Endeavour all ready to go again." Mark Kelly's wife is wounded Arizona Congresswoman Gabrielle Giffords, who was shot in the head during a constituent meeting in January in Tucson, Ariz. Giffords intends to travel from her Houston hospital to come watch her husband lift off in person this week, according to news reports. "I'm personally looking forward to my wife, Congresswoman Gabrielle Giffords, getting here pretty soon," Kelly said after arriving at KSC. "She's excited to be making this trip." Shuttle weather officers are currently predicting an 80 percent chance of clear weather for Friday's launch. The crew will ride Endeavour to the International Space Station for a two-week mission to deliver spare supplies and a new astrophysics experiment to search for exotic subatomic particles. The voyage is Endeavour's 25th and final mission, and the penultimate flight for NASA's three-orbiter space shuttle fleet. After it lands, Endeavour will be processed and sent to the California Science Center in Los Angeles for public display. The final planned space shuttle mission is the June 28 flight of the shuttle Atlantis, which will also haul up spare supplies to help outfit the International Space Station for the era after the shuttles retire.